A sudden change in weather calls for a change in driving. You should slow down when driving in rain and fog. Be particularly aware of vehicles coming up behind you in inclement weather. If the weather changes suddenly, you will need to adjust your driving to adapt. Always slow down when driving in rainy or foggy conditions. Be especially aware of vehicles behind you that may be going too fast for conditions. The sign with this shape and color is a _____________ sign. 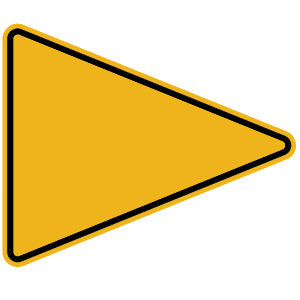 Pennant-shaped warning signs like this are only used to indicate a no passing zone. 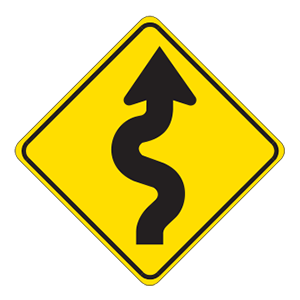 If a driver's left arm and hand are extended upward, they are indicating that they intend to turn right. 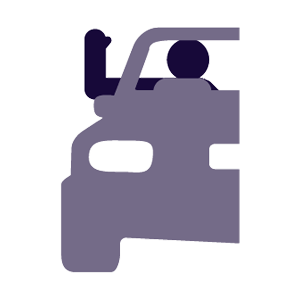 Adjust your driving accordingly if following a driver who is using this hand signal. Flash your lights at oncoming traffic. Use the lane that belongs to oncoming traffic. Passing on a two-lane, two-way road requires good judgment because you must use the lane belonging to oncoming traffic to complete your pass. Only pass if you may safely and legally do so.